Kathleen started her teaching career at the age of 16, for Wilton Industries; youngest instructor to have taught for Wilton; total 21 years. Kathleen received numerous awards from Wilton; Hall of Fame and Imperial Club Awards; as a top instructor, teaching at the highest volume stores; teaching over 10,000 students as last recorded by Wilton, the year 2000. During her lifetime, she has visited 50 US states, taught in 20 states and 14 countries, teaching in over 50 cities since 2010. She continued teaching for San Diego Grossmont Adult Schools for 10 years; assorted culinary classes, working with a variety of mediums and techniques. She worked in area high end bakeries; consulting and training area bakery owners and employees; owned and operated her own high end wedding cake bakery & supply store in the 90’s. She has taught since the beginning of her career and is now highly regarded innovator and is internationally known for royal icing, foreign techniques and the revival of the Lambeth Method of English Overpiping; adding her own modernized flair. "She continued teaching for San Diego Grossmont Adult Schools for 10 years; assorted culinary classes, working with a variety of mediums and techniques. She worked in area high end bakeries; consulting and training area bakery owners and employees; owned and operated her own high end wedding cake bakery & supply store in the 90’s. She has taught since the beginning of her career and is now highly regarded innovator and is internationally known for royal icing, foreign techniques and the revival of the Lambeth Method of English Overpiping; adding her own modernized flair. She continued teaching for San Diego Grossmont Adult Schools for 10 years; assorted culinary classes, working with a variety of mediums and techniques. She worked in area high end bakeries; consulting and training area bakery owners and employees; owned and operated her own high end wedding cake bakery & supply store in the 90’s. She has taught since the beginning of her career and is now highly regarded innovator and is internationally known for royal icing, foreign techniques and the revival of the Lambeth Method of English Overpiping; adding her own modernized flair. Most recently, October 2017; Kathleen Coached Michelle Sohan and competed as Team Trinidad & Tobago in the Milan, Italy Cake Designers’ World Championship FIPGC 2017, winning “The Best Cake Taste in the World 2017” and placed 7th; competing against 19 other countries. 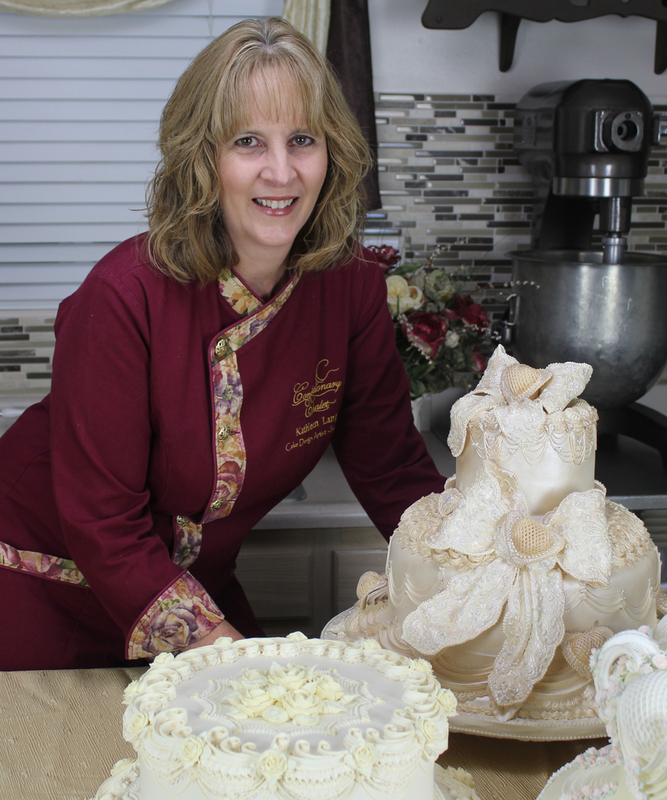 - May 2016; Kathleen has been named one of the Top Ten Int’l Cake Artist by New York Cake & Baking at The New York City Cake Show and is recognized internationally for her Lange/Lambeth English Overpiping Boot Camps. Kathleen is an active member, instructor and demonstrator of the USA Division Representative & Int'l Excellence Team Cake Designer of (FIPGC) International Federation of Pastry Gelato & Chocolate – Italy; ICES (International Cake Exploration Societe); 3 C's (California Cake Club); San Diego Cake Club, RBA (Retail Bakers Association); IBE (Int’l Bakery Expo, Hong Kong; IBIE (Int’l Baking Industry Expo, Las Vegas, NV) and other Industry Shows, Culinary & Pastry Schools. She has been featured in numerous trade publications, cover of the Food Section of San Diego Union-Tribune; San Diego News and Radio stations; Milan, Italy Radio and she has contributed tutorials to several Int’l cake decorating newsletters and magazines and now releasing her own instructional DVD's.